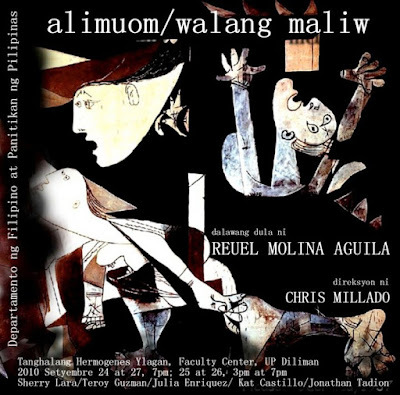 Reuel M. Aguila's Walang Maliw and Alimuom will be staged on September 24 & 27 (7pm), September 25-26 (3pm & 7pm) at the Tanghalang Hermogenes Ylagan, Faculty Center, UP, Diliman. Sherry Lara, Teroy Guzman, Julia Enriquez, Paolo Rodriguez, Jonathan Tadioan perform in this production. Renowned theater artist Chris Millado directs the two award-winning works of Aguila that tackle human rights drama. “This is the initial offering of the Department of Filipino and Philippine Literature’s Tanghal Likha (Stage Works), a program which produces for the stage the plays, poems, fiction, and other creative works by students and faculty members,” said Dr. Jimmuel Naval, the department chair. Aguila received the lifetime achievement award "Pambansang Alagad ni Balagtas" for playwriting by the Unyon ng mga Manunulat sa Pilipinas in 2004. He is also a Palanca Hall of Famer. Chris Millado heads the Performing Arts Department of Cultural Center of the Philippines.